Most of you have probably clicked on this photo in horror- how can someone do this to someone’s hair? Perhaps many of you have formed the opinion that the hairdresser behind this ‘monstrosity’ should jack in hairdressing altogether. But what if I told you that the truth behind this photo was far from your thoughts and opinions? Well take a seat, grab a cuppa and let’s take a look at this debacle as a whole. I woke up Friday morning to find the above. Sure, it got my attention and the words ‘poor girl’ was muttered underneath my breath, but it was only until I noticed the accused hairdressers did a huge feeling of guilt hit me across the face. This accused hairdresser was my very own, Courtney Hamblin who is a professional hairdresser and extensionist who every time does a fantastic job on my hair. What on earth has happened here? I wondered. And I must admit, if I hadn’t personally known Courtney I probably would of shared the post with the caption ‘OMG’ slapped across for everyone to see. But I knew that there was more to this photo-something really didn’t ring true. So I searched for the other side of the story before I came to any sort of opinion. This was when I came across the above post and as you can see, it is a completely different story to the one above. Now I too live over an hour away and I personally know that Courtney would never usually accept a consultation via a photo (or go off from what a previous extensionist had done). 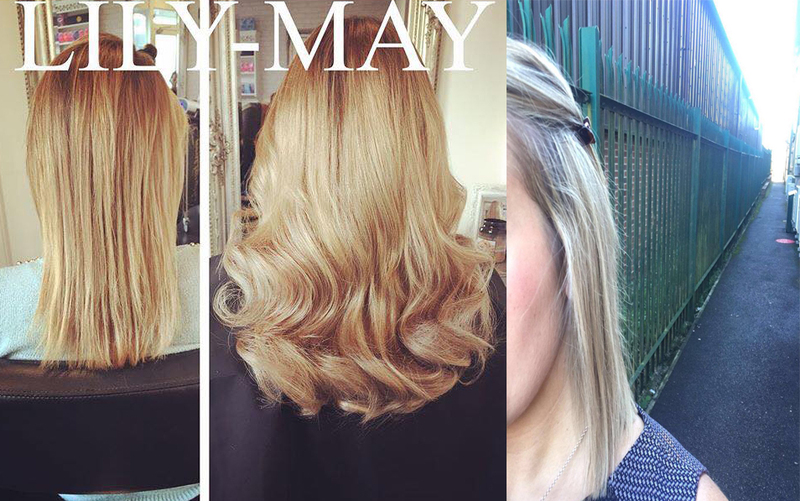 Now Courtney worked closely to another talented hair extensionist Lily May and below is the client’s previous before and after pics. Now if Courtney were sent these pictures like this it tells you two things: 1, the lady has blonde hair and matches the hair that was inserted and 2, she doesn’t have a blunt bob. So technically the client sent misleading photos. I know that a lot of extensionists who regularly go off current photos and if anything, I think the colour is a perfect match from what was sent. So this leads me to query one other thing, why is her hair darker from the photo she sent? It doesn’t make sense. When the client came to the appointment Courtney asked if she recently had her hair cut to which she replied yes. 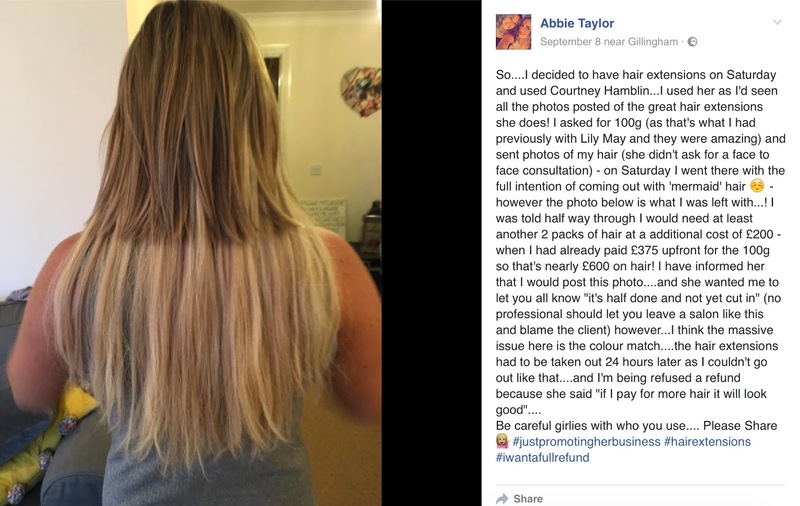 Now I am of the opinion that the client’s hair had also been dyed darker since sending the ‘current photos’- just look at the photo below. 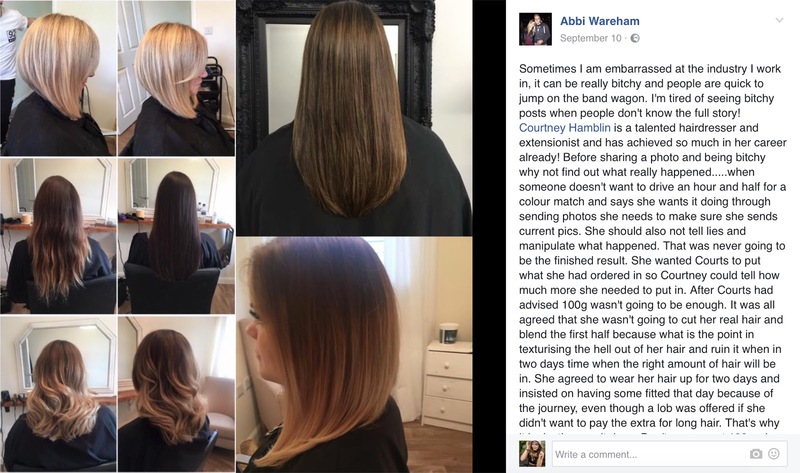 Courtney then explained she would need more than 100g of hair as the base line was too blunt, so an additional price was agreed and the client was going to ask her parents to pay for the remaining balance. As it was a Saturday Courtney was unable to order in the additional hair in until the Tuesday- which meant the hair couldn’t be applied. 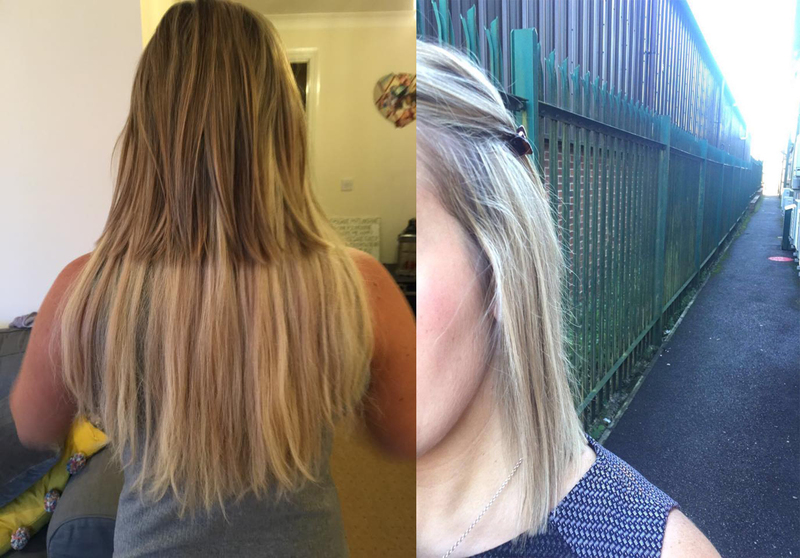 Ok so the application itself- because the client was going on holiday and given she didn’t finish work until 5pm on a week day, she insisted on having the hair fitted there and then as she already had made the journey (the root of the problem to all of this don’t you think?). 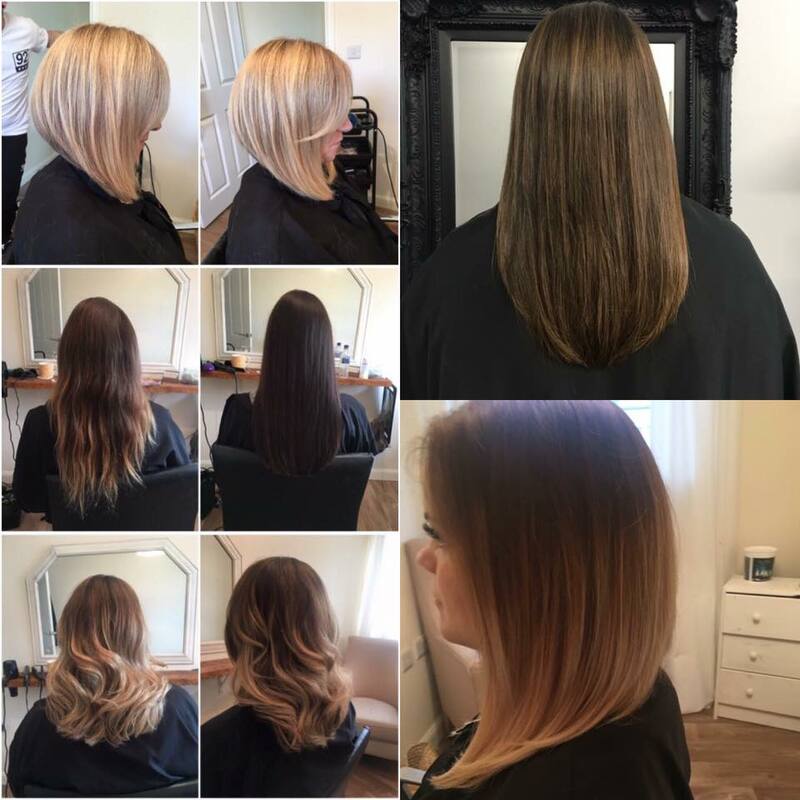 Despite Courtney’s reluctance, the hair was fitted and it was mutually agreed that the remaining hair would be fitted on the Tuesday (2 days later) and the client left happy. The additional hair would of been darker and blended throughout the hair to create a perfect match. What you see in the first picture is not the complete look– it is half done. For me the matter was being dealt with professionally and I am sure many hair dressers come across issues like this in their careers- we are all human for god sake. The fact that her derogatory post has over 14,000 just makes me so sad, Courtney truly is a talented hair dresser and extensionist (just take a look at my before and after photos above). 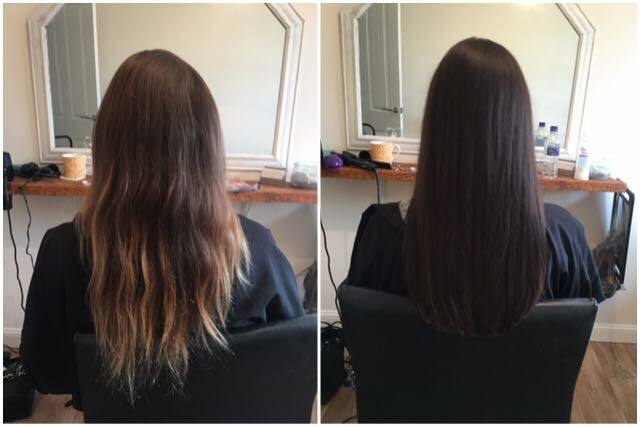 If you don’t want to travel to get hair extensions, then don’t book someone an hour and a half away! 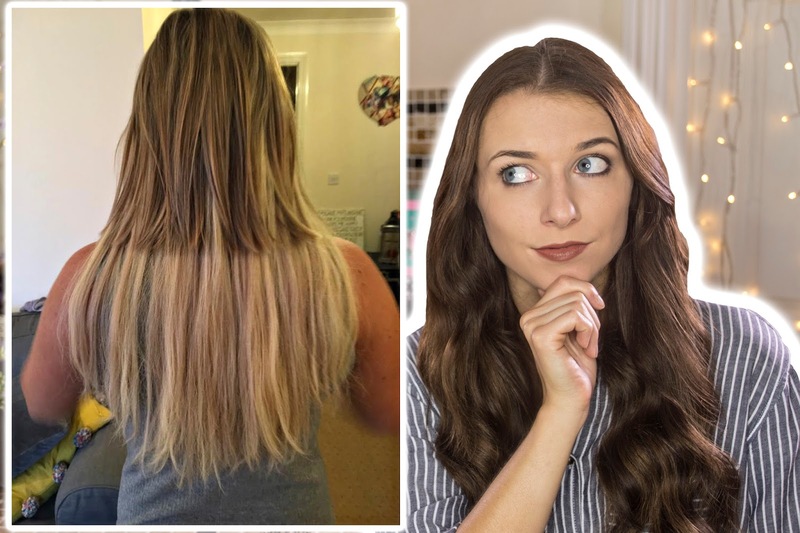 I also think that if you are going to get hair extensions never shop on a budget- hair is hair, different lengths and thickness differentiate in £££ I am afraid. So my message to you is this; every time you share a potential damaging post on social media be sure to read both sides to the story. I am all for ‘freedom of speech’, but in this case I really think that it wasn’t exercised fairly. Sure, the client is probably extremely upset that she didn’t get her desired hair but when you weigh up the facts, I really do not think Courtney’s is just to blame. Not only can being slated on social media be damaging to a business, but it can ruin someone’s self confidence. 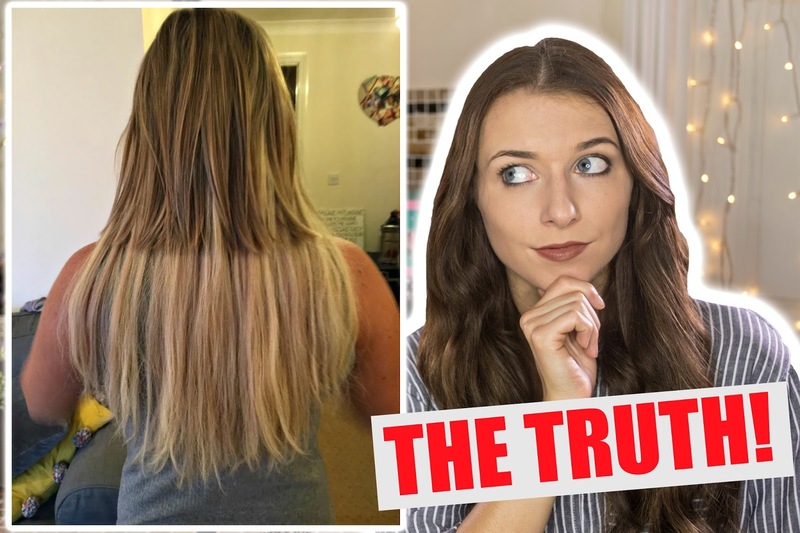 People have even gone to the effort to fabricate more lies by copying and pasting terrible hair cuts from Google and claiming them to be Courtney’s work. Just reading a few of the comments has sickened me- it’s like I am witnessing cyberbullying between adults. The quality of Courtney’s work are displayed in the images below, so be sure to form your own opinions and let this be a lesson not to share things on social media misinformed. What do you reckon? Do you agree/disagree with me? Previous Post Behind The Scenes Of The Mermaid Video!